Going green has never been easier! This Recycled Pre-Punched Binding Paper brings more peace of mind, reduces system wear, and saves you plenty of time when preparing your documents and proposals! Made from 100% post-consumer waste, the paper is both FSC and PCF certified. The paper is punched a few sheets at a time, so it will run smoothly through your printer or photocopier. Choose between the 20, 24,28, or 32 lb paper – we carry them in various sizes, including letter, legal, and ledger. Looking for a certain punching pattern? You'll find it here, among the numerous options listed below! This is MyBinding video. 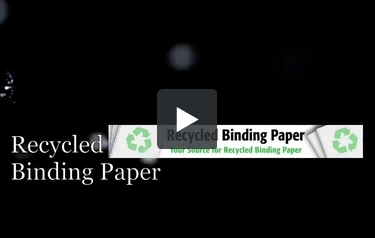 Are you looking for recycled binding paper? Well, you found the right place. We are proud to carry our new line of environmentally conscious recycled binding paper. Every day is Earth day so our recycled binding paper is completely eco-friendly to help people be more active with green solutions wherever they are. We offer them in 20-, 24-, 28- and 32-pound weights as well as we have a great customizing department and we can pre-punch your papers for you for any binding system out there. So check out the website, use the dropdown menus or give us a call if you have any questions at all. When image matters, MyBinding.